note: The later production run of the 1976 model used the 1977-1983 Corvette Radiator. If your top hose curves up and in, these are the correct radiators. If the outlet comes straight out, please look at the 1977-1983 radiators and verify the overall size. Core Size: 17" tall x 27.5" wide x 1.75" thick; Total Size: 18.63" tall x 31.63" wide; EC478; Chevy Corvette All Aluminum Radiator 1973-1976, Champion Cooling Systems radiator. 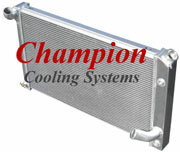 Core Size: 17" tall x 27.5" wide; Total Size: 19.5" tall (19.75" with cap) x 33.5" wide; CC478; Chevy Corvette All Aluminum Radiator 1973-1976, Champion Cooling Systems radiator. Core Size: 17" tall x 27.5" wide; Total Size: 19.5" tall (19.75" with cap) x 33.5" wide; MC478; Chevy Corvette All Aluminum Radiator 1973-1976, Champion Cooling Systems radiator.